ISH Residents were treated to a unique opportunity to attend a Marine Corps’ Evening Parade hosted by the Commandant of the Marine Corps, General James Amos and Mrs. Bonnie Amos at the Marine Barracks on June 20. The Parade honored Secretary of Defense Chuck Hagel. Secretary Hagel’s wife, Lilibet, is a member of the ISH Board of Directors. Residents also attended a reception preceding the parade at the Commandant’s residence at which time they met Commandant Amos, Sergeant Major Michael P. Barrett and Corporal William Kyle Carpenter. Corporal Carpenter was recently awarded the Medal of Honor, the nation’s highest military honor, for his service in Afghanistan in 2010. 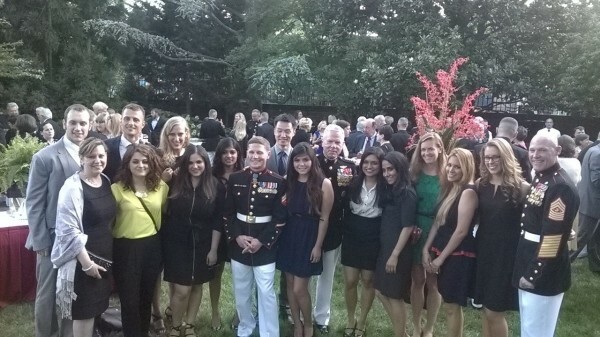 ISH Residents with Commandant General James Amos, Sergeant Major Michael P. Barrett and Corporal William Kyle Carpenter.